He’s always travelling (because of the work he’s doing). He went to some decent places in time, met enough interesting people to keep him going on. The best ones were the ones he didn’t see them coming.He’s the kind of guy that doesn’t watch TV, he gets his information online. Wherever he is, give him Internet and he’ll be happy. He found the most interesting people online. So he met this girl. They were always talking about anything and about nothing. She had a crush on some other guy and he knew it. He, on the other hand, had a crush on a girl and she knew it. That didn’t stop them from talking, they talked about what’s happening with them and maybe this brought them closer. This story is not a sad one because they were in the same country once. He knew it and he wanted to go to her, to surprise her, to put a face to those nice conversations. Sadly, he was too far away. One day he, while he was at work, got this messages from her, asking where he lives. He answered them without hesitation and without giving it too much importance. They talked like usual that day. He stayed late at work, that day he came back to the hotel at about 7 o’clock. He threw the backpack on the bed, pulled out the laptop, put on some music and noticed there are no new messages from her. It was not unusual, she didn’t have a regular schedule. He opened some websites, almost fell asleep when he heard a knock on the door. He didn’t get a lot of interaction, maybe with the cleaning lady, in his days off. There was this time when some girl got the wrong room, but that was it. He opened the door just to see this girl standing there. “Another one who got the wrong room”. He smiled and greeted her in English. She replied in his native language. It was her, the girl he’s been talking to for so long. There are no words to describe his face when he realized that. His jaw hit the floor at supersonic speed. After staring at her for a few seconds, he invited her in. He stepped back carefully, so he would not hit any walls. The room was pretty small, with a large bed and a long desk (which he used for everything). He could not take his eyes of her. He saw some photos of her, but those didn’t show her entirely. He kept smiling and hitting the furniture, like having reminders that he is not dreaming. It was not too late to go out, he knew a few places. She knew how to cook, but there was no kitchen there. He took her to the Italian restaurant, it was the best of them, he knew the dished well, the atmosphere was nice enough to stay a little longer. He didn’t ask her where she would stay, but he knew she didn’t have anywhere else to stay. They went back to his hotel and she wanted to take a shower. It’s a good thing he brought that extra towel from home. She came back from the shower wearing that towel only. – Are you going to do anything, since you came out of the shower like that? – I never like to get dressed in the bathroom. – I still don’t know why you came here. – I came to see you, silly. You were interesting enough to be worth the trip. – Was I? That is flattering. They kept teasing each other until their eyes met in this long stare. He felt his mouth go dry and his heart beat faster. She noticed that instantly and she pulled him closer to her. He didn’t have too many thoughts in his head, there were a few repeating themselves. So he started responding to her and make her want him. 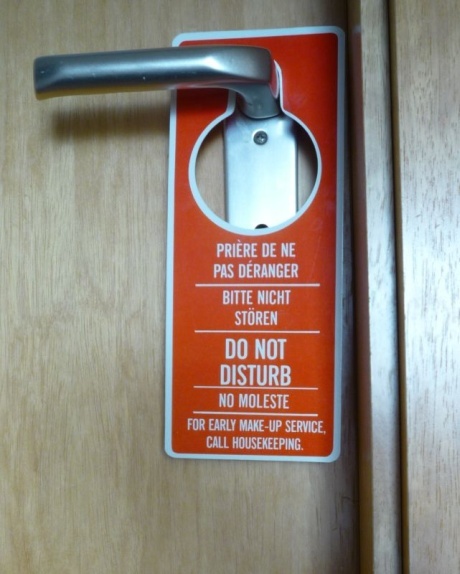 Please, do not disturb! I took the photo from Wikipedia.